Some Great (and surprising) News!! "That Donnelly Crowd" my most recent short story (False Faces Anthology-up for Colorado Book Award) has been chosen for 2019 The Best American Mystery Stories -- Jonathan Lethem, 2019 editor!! Currently available on Amazon in paperback and Kindle. Also--check out Mark Stevens RMFW podcast: False Faces Produces Two "Best American Mystery Stories"If there has ever been a reason to declare "Breaking News" around Rocky Mountain Fiction Writers, this might be it. 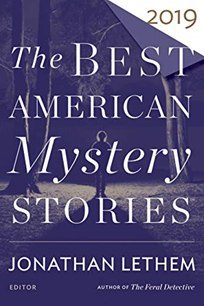 For more than 20 years now, editor Otto Penzler has been publishing a volume called the Best American Mystery Stories. As part of that process, he reads some 500 short stories and passes along the best 50 to a guest editor. That guest editor then chooses the top 20 to be published. This year, the guest editor is Jonathan Lethem and out of the 20 stories to be published two were selected from RMFW’s False Faces short story anthology, which came out last year. The two writers are Anne Therese Macdonald (“That Donnelly Crowd") and Suzanne Proulx ("If You Say So"). On the podcast, we chat with False Faces editors Angie Hodapp and Warren Hammond and then with each of the two writers—whose work will go national later this year. As if that’s not enough great news for False Faces, the anthology was also named this week as a finalist for the Colorado Book Awards. Yes, more Breaking News. Welcome to the website for author Anne Therese Macdonald. She is primarily known for her short stories, which have been featured in journals such as Blue Earth Review, Dublin Quarterly Review, and the Belletriste Review. Her debut novel, "A Short Time in Luxembourg" was published in 2004 by Gardenia Press. Please follow the links above for excerpts, select short stories, reviews, and further information.